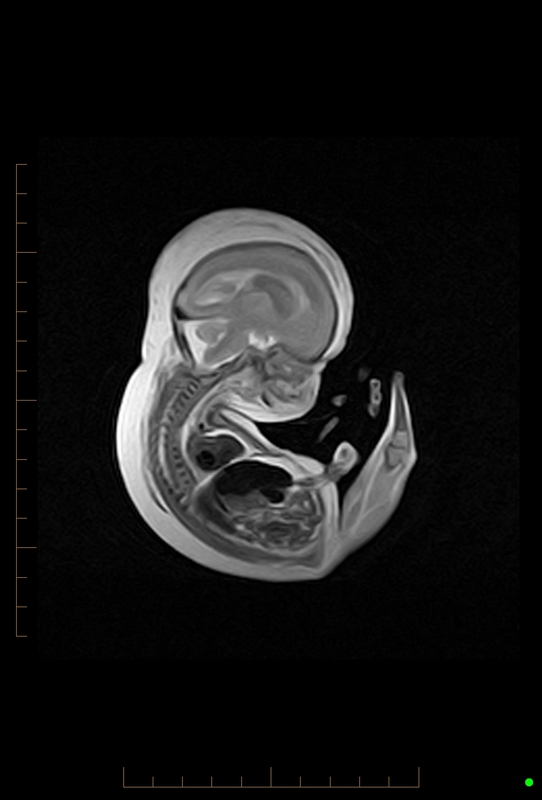 What one-in-one-hundred-thousand diagnosis is seen in this fetus? 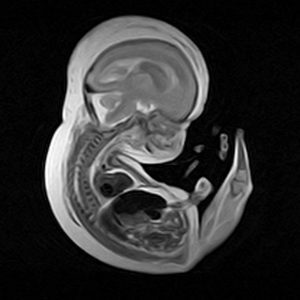 This fetus has a rare diagnosis. What is the diagnosis, and why is the movie “Splash” with Tom Hanks and Daryl Hannah a tip-off? The answer is sirenomelia, which is also known as Mermaid syndrome. In this particular case, the infant was stillborn with complete fusion of the legs. The leg fusion gives the appearance of a mermaid’s tail. The condition is seen in 1:100,000 live births; about as rare as conjoined twins. The patients usually have kidney and bladder dysfunction and more than half the cases are stillborn. The condition is 100 times more likely to occur in identical twins than in single births. Failure of the normal vascular supply from the lower aorta in utero is the suggested cause. For more case review, check out MRI Online.